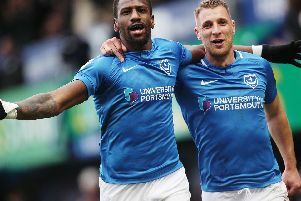 Aaron McCarey admits he is open to the idea of a permanent Pompey stay. The goalkeeper was originally drafted in on an emergency loan to cover injuries to Paul Jones, Brian Murphy and Michael Poke. In his three games so far, the Irishman has won one, lost one and drawn one and conceded three goals – with his existing deal set to expire in a fortnight. And although he is enjoying his Fratton Park spell and would be prepared to extend his loan deal, he also revealed he is considering heading for pastures new at the end of the season when his current contract is up at Wolves. McCarey said: ‘It’s been very enjoyable. ‘It’s been a fantastic experience for me to come down and get some games. ‘To play in front of that crowd at Fratton Park has been very beneficial to me and I’ve really enjoyed everything about it. ‘I’m 23 now and 24 in January. ‘So I’m coming to the age now where I think I need to be playing regularly. ‘I certainly wouldn’t see it as a step down in coming to a club of this stature. ‘All of the foundations are in place to go all the way through the divisions again. ‘As long as you are playing first-team football, I think that’s all that matters. ‘My contract is up in the summer but they (Wolves) have got an option of an extra year. So we will see how it goes. ‘I’m quite a relaxed, chilled-out person but there does come a time when you have to think about the future. With Murphy closing in on a return to fitness after a groin problem, boss Paul Cook will have a decision to make in the coming weeks. But McCarey knows he is still in the process of trying to impress the manager. He said: ‘There hasn’t been a conversation as yet about extending the loan or anything. ‘I’m just concentrating on the month and if something arises and the club want to keep me on, I would be more than happy to do so. ‘It’s a fantastic club but that decision is not in my hands. I have thoroughly enjoyed working with the coaching staff and the players. ‘But it’s football and you never know what might happen around the corner. ‘It can change from week to week and I try not to get caught up in it. ‘At the moment, it’s like a shop window for me and I’m trying to get my name back out there. ‘Wolves might be looking to see if I can produce the goods at this level. ‘But I have played in League One and League Two and I have no problem about playing at this level.